Black smoke billows from the chimney of the Sistine Chapel on March 12. 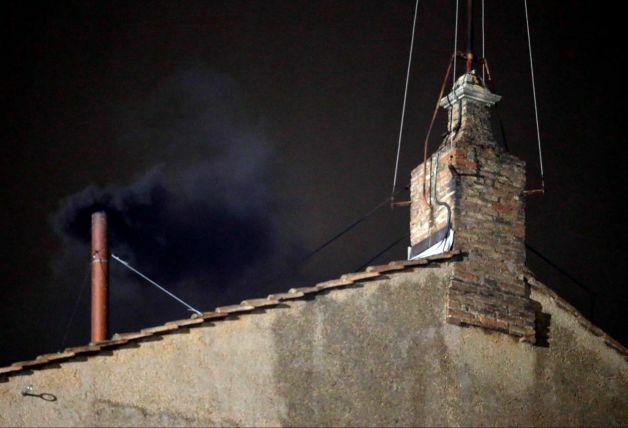 MARCH 12, 2013–Some cheered, but most of the pilgrims in St. Peter’s Square groaned when black smoke began to billow out of the chimney of the Sistine Chapel this evening at around 7:40 pm local time [2:40 Eastern]. The cardinals’ first vote in the 2013 conclave–as expected–yielded no winner. A two-thirds majority is necessary in order for the future pope to be asked if he accepts the “burden” of the papacy. “As soon as the cardinals exit the Sistine and get on the mini-buses to the Domus Sanctae Marthae, their residence inside Vatican City,” writes former Vatican reporter John Thavis, “they begin to talk, to reflect on the balloting and, yes, even to promote their candidates to brother cardinals. Tomorrow, the cardinals will move from the Domus Sanctae Marthae to the Pauline Chapel at 7:45 am where, at 8:15 am, they will celebrate Mass. At 9:30am they will enter the Sistine Chapel, pray the Liturgy of the Hours, and proceed to the voting process. The next smoke signal is expected around noon in Rome [7 am Eastern]. Around noon, they will return to the Domus Sanctae Marthae and, after lunch there, will go back to the Sistine Chapel at 4:00pm where they will pray briefly and resume the voting procedure until 7:00 pm [2 pm Eastern] when the final smoke of the day is expected to rise. A billion Catholics wait and pray for the Holy Spirit to inspire the 115 elector who will choose the 266th successor of St. Peter. Thank you, Patrick for all this good info. Back here in the states, I was listening to a popular local radio station in the car on way home from Mass and was so upset over all the misinformation – comments and laughter about “lavender” smoke, etc. But then they started saying that Catholics don’t know or use Scripture!!! I almost blew a brain fuse! I wanted to call in and tell them not only do Catholics know Scripture, the New Testament was written by Catholics, the Catholic Church decided on the canon of Scripture. They were talking about how the Pope isn’t Biblical and I would have pulled over and called the show but didn’t know their number – all I could do was silently scream in my head about the ignorance that persists about the Catholic Church and the blindness to TRUTH and offer up a prayer!